With Fantastic Four #4, we have truly the signs that the series is in its early stages of greatness. 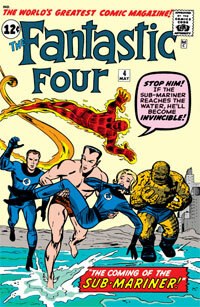 this volume is in effect the first time in Fantastic Four that the ending events of the last issue directly effect the next. leaving no feeling of a great loss of time, in #1 to #3, it could be hard to tell how much time has elapsed between the events. it could be days, or months. and most of the time, it has the feeling of being months. perhaps to match the length of time between issue releases? But this time, the events of this issue pick up just a short time after the last.